Aon Hewitt offers comprehensive expert insights related to Retirement Solutions for human resources professionals. Select from the topics below for lists of human resources articles, whitepapers, reports and webcasts. 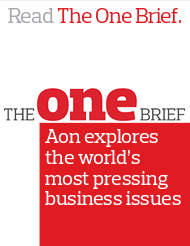 Pensions & Investments interviewed Cary Grace to discuss the results of the P&I 2017 Investment Outsourcing Survey and learn more about Aon's 18% year over year growth to secure the #3 position. Chief Investment Officer spoke recently with Stephen Cummings, chief executive officer of Aon Hewitt Investment Consulting Inc., one of the fastest growing providers of outsourced chief investment officer solutions, to find out where and why demand is growing - and how new users of the OCIO model can make it work for them. These reports shows that the average oil and gas company continues to provide valuable retirement programs with many committed to defined benefit plans despite headlines in the media. Recently, a group of Aon’s senior leaders across the Retirement & Investment Consulting practice came together to discuss ‘best practices’ of Global Pension Risk Governance. Learn about the latest topics in Retirement and Investment from Aon Hewitt's 2017 whitepaper series. Download complimentary copies of all whitepapers. The purpose of this white paper series is to provide insight and strategy for health care organizations in the midst of such dramatic change. What was happening in the retirement and investment industry last year? Download complimentary copies of all 2015 whitepapers to find out. Looking for archived retirement and investment whitepapers? Download complimentary copies of archived whitepapers. Aon’s most recent survey provides insights regarding financial management of retirement programs in the utility industry. Our consultants examine all key levers – funding, investment, design, liability management, and actuarial assumptions and methods. Aon’s 2018 U.S. Annuity Settlement Market Update provides a detailed overview of how innovation is driving market growth and shares insights for pension plan sponsors, as they continue to address cost & risk in an ever evolving market. Our research found that the insurance industry continue to provide market-competitive benefits overall, and offers especially valuable retirement benefits to its employees. However, the level of spending on retirement benefits and the degree of commitment to DB pensions varies considerably. Download our findings to learn more. Aon Hewitt’s sixth installment of The Real Deal Study analyzes the financial retirement readiness of 2.1 million employees of 77 large U.S. employers. Based on the responses retirement plan sponsors provided to Aon Hewitt’s Hot Topics in Retirement and Financial Wellbeing survey, this year should be a very busy year for them. We are hearing from employers that they do not intend to sit on the sidelines waiting for the environment to dictate their next move. Instead, they are taking action in an effort to bolster employee benefits and help their workers plan for a secure financial footing - both today and in retirement. Download the the 2016 Universe Benchmarks report and you will find defined contribution plan data from more than 125 plans covering roughly 3.5 million eligible participants. Many rules that otherwise apply to qualified retirement plans either do not apply to governmental plans qualified under Internal Revenue Code (Code) Section 401(a) or apply differently. This article provides a high-level introduction to governmental tax-qualified retirement plans and highlights many of the differences in applying rules of the Code. Differences in application of many of the rules are conveniently summarized in two tables. This article also briefly discusses the applicability of the Age Discrimination in Employment Act (ADEA) to governmental plans. Employers, participants, and even tax professionals may be confused about the reporting and withholding requirements because participants are often no longer active employees when the NQDC benefits are paid. This article provides a general discussion of the reporting and withholding requirements for NQDC plans. Deferred compensation that falls within the scope of Section 409A of the Internal Revenue Code is subject to strict compliance guidelines, and when deferred amounts fall out of compliance, the amounts can be subject to taxes, penalties, and reporting requirements. This article addresses the premium interest tax beginning with the identification of amounts subject to premium interest tax, as well as the calculation of the premium interest tax and underpayment interest. These 10 observations can help an investor make beneficial decisions on an equity portfolio structurs in a world with rules-based investing tools, starting with their basic drivers of return. With the changing retirement landscape, employees need to accept greater responsibility to finance their retirement income and retiree-healthcare benefits. And employers must recognize and react to the chang needs for retirement planning resources. Roth Is on the Rise: Is Roth Right for Your Plan? Nearly three out of 5 defined contribution plans surveyed now offer Roth contributions, and nearly one out of five offers in-plan Roth conversions. Roth can offer participants tax diversification. This article provides an overview of the contribution and conversion rules, and contrasts Roth contributions with traditional after-tax contributions and Roth IRAs. This note provides an overview of the issues to consider when selecting and monitoring target date funds (TDFs). It describes the legal framework surrounding target date funds and the steps that plan fiduciaries should take to select and monitor TDFs. Employers sometimes ask how long they should retain retirement plan records. The prudent answer, it turn out, is generally a very long time. This article reviews relevant rules, related guidance, as well as related court decisions. Is It an Unforeseeable Emergency or a Hardship Distribution? Many plan sponsors and advisors use the term “hardship distribution” to describe both a hardship distribution from a qualified plan and a distribution due to an unforeseeable emergency from a nonqualified plan. This colloquial use of the term is fine, provided everyone understands the very real differences for such distributions to be compliant. The plan sponsor world is presently going through a major adjustment since the IRS ended its determination letter program to maintain tax-qualified plans. These articles will reacquaint readers with the events that led to this decision and identify possible strategies for employers to consider in an effort to confirm and protect the tax-exempt status of their qualified plans. Throughout 2017, Aon brought together our clients and subject matter experts in a series of thought-provoking Retirement webinars to share solutions focused on changing the way America retires. This quarter we discuss department of labor guidance on economically targeted investments, new programs to reduce student loans while saving for retirement, debate of monitoring roll over marketing practices and so much more. This quarter we discuss financial wellbeing programs, fiduciary investment advice rules, cybersecurity and the risk of a data breach involving participant data in retirement plans, and much more. In this issue we provide updates on the ongoing litigation between ABB, Inc. and Tussey regarding an investment option in ABB’s 401(k) plan, the new applicability date for the disability claims procedure regulations, the latest required amendment list issued by the Internal Revenue Service and much more. This edition discusses cybersecurity of retirement plan data; pension funding and the recent tax reform proposals; recently issued IRS guidance of interest to qualified plan sponsors; benchmarking fees for defined contribution plans and much more. This quarter we focus on preparation to implement alternative settlement actions that do not result in terminating the entire plan; IRS issued new procedures for obtaining opinion letters on pre- approved plans; how to calculate the appropriate remedial amendment period for fixing plan qualification errors now that the five-year cycles have been eradicated and more. This issue discusses actions that plan sponsors can take now to navigate the stages of their defined benefit retirement plan; fiduciary inverstment advice rules; the Supreme court decision regarding Verizon's annuity lift-out litigation; new disability claim procedure rules; the impact of New Puerto Rico Tax Law to retirement plans and so much more. This edition includes insights on how the provission of retirement benefits could evolve in the future, details on Aon Hewitt's new solution in regards to the termination of the Internal Revenue Services's determination program, useful information to limits & compliance deadlines, and much more.